There’s no such thing as owning too much flash storage, and you can stock up on flash drives and SD cards in today’s Amazon Gold Box. In addition to the bog standard SD cards and USB 3.0 flash drives that you’d expect to find (256GB microSD card, anyone? ), there are also some pretty clever products to be had in here. My personal favorite is a flash drive that includes both USB-C and USB-A plugs, but you’ll also find flash drives with lightning plugs for your iPhone, microUSB for older Android phones, and even built-in wi-fi so you don’t have to plug them in at all. You can find all of the deals here, but remember that these prices are only available today, or until sold out. If you ever listen to audio from your laptop’s tiny, awful speakers, do yourself a solid and pick up these Logitech alternatives for just $20. At this price, they won’t blow anyone away, but they’ll sound worlds better than your laptop. Half of your electronics charge over USB these days, so it makes sense to buy power strips that include both AC outlets and USB ports. For just $16, this Aukey power strip includes four of each. It’s easy to see why Cuisinart’s DBM-8 electric burr coffee grinder is Amazon’s top seller in the category. It’s affordable, it’s dead simple to use, it includes 18 coarseness settings, and it looks great. Today’s $37 price tag is roughly $8 less than usual, so perk up, and lock in your order before it sells out. Some people would probably give a kidney to own a Nintendo Switch, so if you’re one of the lucky few that’s actually gotten their hands on one, you’d damn well better take good care of it. For a limited time, get a pair of Anker screen protectors for $6, or $3 less than usual with promo code NO1B7475. We could debate whether $250 for a golden 1TB PS4 Slim is a deal: MSRP for the console is $300, but Sony has explicitly said that this one will cost $250. That said, the gold model is only available for a limited time, so if you like the color, this is your chance. 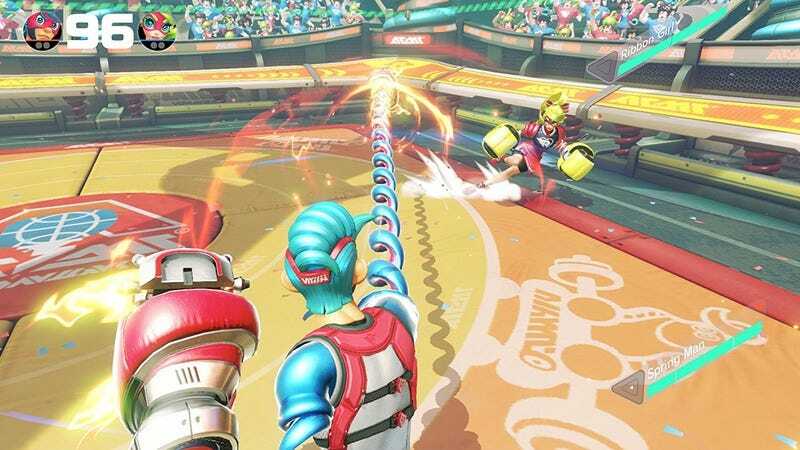 Arms sure seems like it’s going to be the Switch’s third must-own game, and you can get it on launch day for $48 if you have Amazon Prime. Just note that you won’t see the discount until checkout.